Anyways, I’m just back from the Ashanti Region E.P.A. office that is coordinating the activities to mark the day. NOW THAT’S WHAT’S SURPRISING! For years Four Villages Inn has been lodging a complaint against an apetesie (moonshine) bar behind us. Well, I thought I’d commemorate the day by submitting another letter of complaint about The Point. Yesterday with the big double-header football matched Kotoka and Chelsea playing and both winning there sure was a lot of celebrating going on at THE POINT. Now this is not the first time The Point has been mentioned in this blog. Type into search ‘The Point’ and read the continuing saga of Four Villages Inn’s war against this illegal structure. The drama even includes a killing! But let me tell you about my visit to the E.P.A. offices. At reception, there were two ladies. I wanted to know if they even knew what day it was. The one who was dealing with me didn’t. She up and left to see if “the Deputy” would see me. The other lady upon prompting did know the special day marked on the big E.P.A. calendar…probably wrongly. So the lady returns and says the Deputy will see me. At his office I introduce myself, mention that it’s a special day whereupon he immediately mentions another department-Environmental Health at the Kumasi Metropolitan Assembly-that is dealing more with the issue of noise pollution. I was expecting this…It always happens…passing the buck here is probably the number one strategy/tactic in dealing with a complaint. Yes, you get the run-around and sooner or later you just give up! Anyways, up gets the deputy to take me to the office of an underling who knows me. He asks me about the noise making at Gina’s restaurant in front of Lahana Avon. I tell him all is fine on that front and I thank him and the E.P.A. for their action. Then he gets out the complaint form and he starts asking me questions to fill in the form. But he doesn’t get past my name before his pen runs out of ink. But I’m quick to provide him with my own pen and we continue. I left….and I forgot my pen too. A while later I got a call from the agent telling me about the pen. 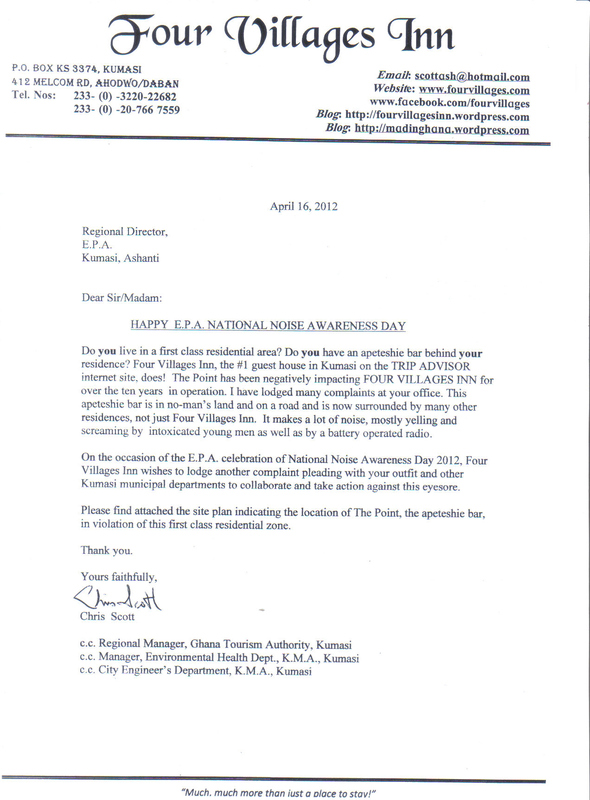 I said it was my HAPPY NOISE AWARENESS DAY present to him from Four Villages Inn! ← GHANA: VOLITILE ELECTION RHETORIC CALLS FOR TOURISM SECTOR TO SPEAK OUT! I surely hope you get this problem fixed. One of the issues that drove me from Ghana. I used to take out books from the Ashanti Library a the Cultural Center (is it still there?) and bring them home. However I had to take take the trotro to secluded spots miles away to read them. There was a hosanna church at the corner that meet 24 times a day (at least it seemed that way), a lotto kiosk about 50 meters away blared loud music from dawn to dusk, etc. When I talked to people around about doing something about the noise all around, they said I was the oddball and that I could move if I couldn’t put up with it.Well, guess what, ultimately I moved.. over 6,000 miles away. I feel for you, it doesn’t seem like people are very bothered by unnecessary noise, I got so mad one day, walked up to a silly DJ who blasted loud music that shook my house and threatened to beat him up after several begging and threats. It worked some how as he doesn’t play music anymore! I also told him I wouldn’t hire him for crap as a DJ because we’d all worked out his music selection skills.